Think like a scientist in this innovative activity book, full of science activities to explore, record, discover and invent. Investigate forces, turbines, mirror writing, skeletons, animal migration and lots more, all using only the book and your pencil case. Includes links to websites with even more science activities and downloadable templates. Alice James joined Usborne in 2015, after several years of working in primary schools. She absolutely loves science, and over the years has lived with chimps, spent a month in the rainforest, studied Biology at Oxford University, and grown 200 carnivorous plants (not necessarily in that order). 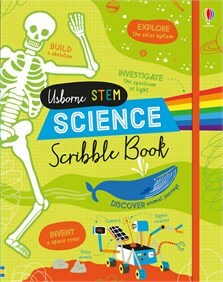 Whilst at Usborne Alice has worked on books on all kinds of science topics, from space to energy to the periodic table.